Initially I was hesitant for this race because I have a half marathon in Naperville, IL the following day. So, I put this race aside thinking it wouldn't be a good idea. However when the opportunity came up to run for BibRave, I emailed my coach at Sweat Tracker to see what she thought about it. I thought for sure she would reply that I was bananas and it was not a good idea. To my surprise, she gave me the go ahead. She reminded me that while it would be a very big challenge, she didn't see any major issues with it. My risk for injury would be greater, though, and that keeping up my strength training would be key. Along with proper pre- and post-race (and training) recovery. So here I am, training for my first spring marathon. It will be interesting for sure, and my one main concern is how much time I'll have to spend on a treadmill at the gym if winter is as bad as predicted. I did train through December for Dopey Challenge, however, I feel winter is usually at its worst in January and February, which will be some high mileage months. I've done up to 12 miles on the treadmill, which for me was just under 3 hours. I thought that was my max, but it's likely I'll be on there for up to 5 hours during this training cycle. Eeks. I guess my main concern is getting kicked off for being on too long haha. Usually weekends aren't as crowded, so hopefully it's not a big deal. It will also be annoying having to reset the treadmill every 60 minutes, as that is the max you can set it to run for. Boo. Interested in running during Illinois Marathon weekend? They have just about every race distance. There's a 5k on Friday evening, and then a 10k, half marathon, marathon relay, and marathon on Saturday. You can take the I-Challenge, which is running the 5k Friday and then either 10k, half marathon, or marathon on Saturday for an additional medal. Who doesn't love more medals? Marathon entrants will receive a high-quality, gender-specific short-sleeve technical shirt (Leslie Jordan brand in blue - must be fate!) and a drawstring backpack. Finishers get a great medal, a fleece blanket, commemorative heatsheet, finish line food and drink, and one beverage at the 27th-Mile Celebrate Victory Bash on Saturday. (Entrants must display their race bib to receive the beverage). I haven't been down to U of I campus since my own college days... which is farther back than I'd like to admit haha. I'm sure a lot has changed, and I've never been inside the stadium, so it will be cool to finish 26.2 miles on the field. The course will be closed to traffic for participants who are averaging faster than 13:45 minutes per mile. 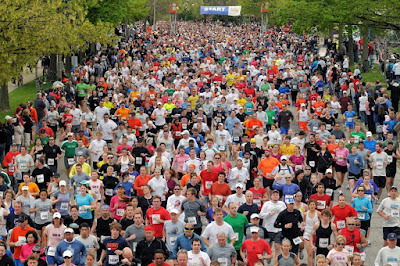 Slower participants may continue after traffic is allowed onto the race course, but they do so at their own risk and must follow pedestrian statutes. Race volunteers, the finish line, and post-race festivities will remain active long enough to accommodate runners taking up to 7 hours. The next price increase will be January 16. You can save $5 off any distance (except Youth Run) using code 'bibravebonus'. I've already begun my training (even before I knew what race I was doing haha - gotta keep that base mileage from the last marathon going). Who wants to join in on the fun? !